An important story, Carole. Thanks for sharing. I am also indignant on your behalf. And on behalf of all kids who may not have enough food, heat, and/or love in their lives. I think you must have made out like a bandit on that last one. This is a great story about judging. I am one of ten children and my father was diagnosed with MS when I was young. He was unable to work so I got free lunch as well. It never bothered me but my older sisters were too embarrassed to let their friends see them get free lunch so they would either go without or use their babysitting money they earned. Their friends would make fun of those who got free lunch. It’s sad that judging starts at a young age. A very thought provoking post, Carole. I’m appalled that someone would take out their suspicions on a child. Horrid woman. Yay for your mom and thanks to you for making us stop and wonder what the whole story is. What a horrid woman! I remember that feeling though myself, but not as a child, but as the Mom of 3 children. When I was single in the 90’s I was getting 75.00 a week for 3 children because my ex-husband started working under the table to avoid child support and I was forced to go the food stamp route to feed the kids and they received free lunches as well and we all frequently received similar treatment. You never really know someone’s story or where they are on their journey. I have tried very hard over the years not to judge as well. I’m always happily reminded how similar we all are when we share some of our stories. Thank you for your important story; I love that it has justice, love, lessons, and those lovely Polly Flinders dresses! There is never a need to humiliate a child, but I fear many of us were and we see it everyday on the news. It’s a wonder we turned out to be the people we are. Thank you for sharing this story and reminding us not to judge the people we see. This time of year it is very easy to give money to charities without leaving your house. Our grocery store asks if you want to add a few dollars to your bill to give to the food pantry in our area. It couldn’t be easier to give. Thank you for sharing this Carole. I have always wanted to be the mom or the sister or the aunt or the pastor (which is what I am) who would be one who would walk into whatever “principal’s” office and speak out in justice and love. God bless your mom. Thank you! The reasons for poverty are complex and it seems we are quick to judge those who need assistance. I volunteer at our local Catholic Worker house that provides a home for single women & their children who otherwise would be homeless or hungry. My favorite time at the house is when I put dinner on the table and we all gather in the dining room to share a meal together. During that daily meal, the barriers between guest & volunteer become blurred and we become like a family. As I was reading your story this morning I was thinking ‘please throw up on the lunch lady, please throw up on the lunch lady’. And you did!!! It is so important that parents advocate for their kids. Your mom was awesome. I hope that lady one day had an experience that made her take a long look in the mirror. So sad. We had food stamps at one point when my Dad was unemployed in the 70’s. I know my Mom didn’t love it but you do what you do. Your Mom was awesome. Thank you for sharing this story, and it’s reminder to just be kind to each other. Oh gah, there should be no apostrophe in its!!! Your story is very powerful and really hit me. The kind of treatment you received is sadly still around, probably even more so. We should be hating hunger, not the hungry. Stunned — I thought just the nuns were mean like that. Events like that stick with us for our whole lives, don’t they? Judgment is so hurtful. Your story shows this so clearly. Thanks for sharing. I have a hug for that little girl. agreed. I grew up in an affluent town as a not-affluent kid. Warm dinners at home always,but very few dinners out. Clothes clean and fitted, but lots of hand-me-downs. Lots of play time w/ our parents, less toys. More camping vacations (i.e. cheap), never a plane ride or beach house. As an adult now, talking to my cousins & family, I realize that the fun “soup and crackers” dinners my mom announced as “a treat!” and that I LOVED (still do) for us were really a way of stretching a tight budget. That “clean out the fridge” dinners were another way of dealing with empty cupboards just before paychecks. You had free lunch, I remember being getting a christmas gift at CCD… and wondering why not all the kids got gifts. my mom said “b/c you were extra good.” not really- the CCD teachers knew we weren’t having a great year. Also didn’t know some of us didn’t have to pay for CCD. Thanks for your story, and the timely reminder. If this were facebook…I’d hit “like.” Today..I am emotional, so I sit at my lunch room table at work and cry. Because I see and hear this sort of judgment all the time, and it makes my heart hurt. 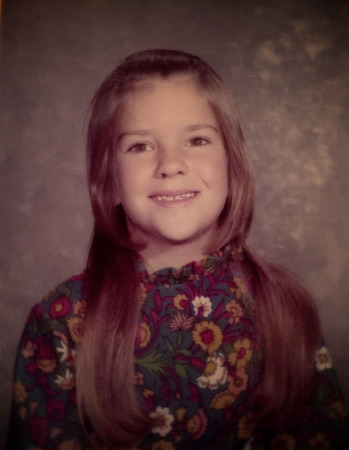 You were a very sweet looking first grader, but I am cheering for your mom! What a fine champion for her little ones! This is such a touching story, and it makes me want to apologize for every insensitive adult who has the potential to damage a vunerable child who didn’t have a wonderful mother like yours. These were acts of a bully…sadly, reminding me of some of the words of today’s politicians. Only the very sheltered or the very lucky have not experienced a situation like this. You ave emerged as a strong and beautiful woman…kudos to you! not judging, being grateful, giving what we can… so many wonderful messages in your story. thank you for sharing it! Very well said and a very important reminder to not only reserve judgement but to remember how far woman have had to come to be able to take care of themselves in times of death or divorce. Oh, if I could go back in time and give that woman a piece of my mind. And a very big hug to your mother. My grandmother was a single mom from the time my dad and his brother were very little. I remember the extremely frugal conditions under which they lived while her ex husband went on to have another wife, a girlfriend or two, and more children. I always felt very fortunate that when I divorced I was already doing well, despite not having been able to finish college and didn’t need a penny of the meager child support that my ex owed and never paid. I’ve always counseled my children not to judge others in the way that they live, dress, or look and have stressed FINISH COLLEGE before getting married to my daughters. Thank you for sharing this story. My 13 year-old son and I work at our local food pantry. His first day there he learned that kids with Gameboys may still need food assistance. This is a beautiful reminder for all of us. Judgement is a very human ideal and a difficult reflex to suppress. Go mom! She sounds like one awesome lady. You tell stories so well Carole and this is one that really needs to be heard. It’s important to be reminded that things aren’t always what they seem. This is a great post. Thank you for sharing your story.